Yesterday we spoke about Adamic, the language handed to Adam by God. It has been suggested that Adamic is the Divine Language, but since this is not a certainty and it's much worse to piss off God than Adam, we decided that we needed to look at the Divine Language on its own. The Divine Language is considered a proto-language despite the possibility that it doesn't exist. Classifying it further would be fairly redundant, although we have seen people do weirder things when encouraged by their beliefs. It would be fair to say that the Divine Language is definitely a language isolate since it can't possibly have any earthly relations. That is, assuming that heaven or any other godly realm is monolingual. 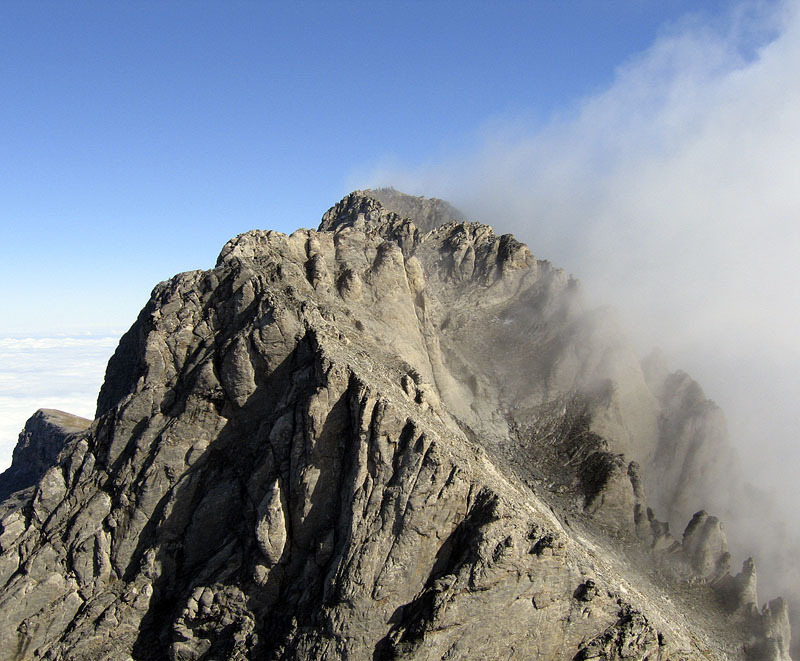 Mytikas, the highest point of Mount Olympus. Many cultures have an idea of a divine language. It is usually required because in many religions God, or the gods, do not live on their own. Within Judaism and Christianity, God hangs out in heaven with angels, archangels and a whole host of staff, for lack of a better word. In Ancient Greek mythology there were several gods that would spend their time on Mount Olympus chatting to one another and occasionally mocking Hades who, despite modern depictions, wasn't all that bad. He was merely annoyed at his job as the manager of the underworld, which is far worse than any job in an office. If we ignore the issue of whether or not God or gods exist, the idea of a divine language becomes even less likely if we consider that immortal omnipotent deities would have little to no need for using their mouths, tongues and vocal chords, if they even have any, to communicate. They would probably use a form of communication far beyond our comprehension.